I have been alone on the road bouncing from park to park for 2 months. My car is a wreck. I rarely don’t smell like feet. But I climb every single day. And it is freak’n awesome! Traveling solo has presented the unique challenge of needing to find new partners at each destination I ramble across. Fortunately I have had the irreplaceable pleasure of getting to climb with wonderfully fun new found friends. Aaand… the dismay of spending entire days roped up with folks I can only barely stand, or seem like they may be TRYING to get us killed. Epic: /’ep·ik/ noun- An outing that extends far beyond its intended boundaries of length, danger, and fun. Often followed by a rescue. Rando: /’ran ·doe/ noun- A random climbing partner. Usually not one’s first choice of person to rope up with. Did they meet up when you both agreed? For many climbers an early start is the foundation of a solid day of sending and adventuring. For others, the crack’o noon start leaves them well rested, detoxed, and hyped to get on their next big project. Either way, if you have to wait around the park shuttle-stop watching the sun scoot across the sky because the Rando is an hour late, don’t be surprised if you end up watching it set from high on a belay ledge soon too. When in a world of walls like Yosemite does the potential match only seem interested in cragging or freak’n bouldering? You’ve driven across the state or even the country. Heck you may have flown across the Pacific Ocean to get here. You quit your job and dumped your boyfriend. Your friends are confused and your parents disappointed, but you finally made it to the land of legendary walls and you couldn’t be more stoked to get your feet off the ground. 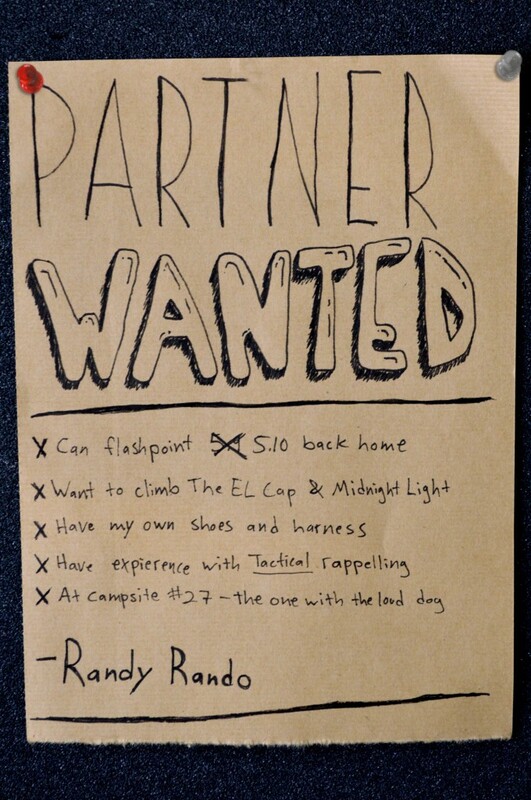 Only problem left is the potential partner you met at Camp 4 only wants to go bouldering. Remind him that bouldering here “is like eating a salad at an all you can eat buffet”. If that doesn’t help they probably just don’t get it and you may want to think about learning to rope solo. Do they offer, or at least acknowledge, the unwritten rule of “if we use my rack, we use your rope”? In many cases the fairest way to attempt to share the wear is to use Climber A’s rope in exchange for using Climber B’s rack. Obviously this depends a great deal on the style of climbing you intend to do and the size of rack you’ll need. That’s why it’s an unwritten rule. But what if your new partner doesn’t offer up any gear at all? It could mean they don’t have any gear of their own, which is fine. You’re both there to climb and if you alone have enough gear for the route, you shouldn’t be wasting a great day whining about who brought what. But at the same time they do call us “dirtbags” for a reason. Don’t let yourself become someone’s personal gear shop and guide service. No, you can’t borrow my only pair of rock shoes. When they told you “Yeah dood, I can climb 5.10 no problem” did they mean “on sight”… or “French free”? Being able to give a new partner an honest idea of how hard you climb is crucial to finding a good match and picking an objective that will suite the both of you well. Even more crucial is being able to discern what they really mean when they “number drop”. Unfortunately the definitions of on sight, flash, and redpoint have become vaguely synonymous for some climbers. Always make sure to clarify. Actually, make sure to DOUBLE clarify by checking that the grades you’re referencing are relevant to the climbing you’re about to do. “Back home” is a classic qualifier many climbers like use. Always be wary of where “back home” is. For example, being a solid 5.10 friction slab climber in Joshua Tree doesn’t really translate well to the vertical laser cut 5.10 splitters in Indian Creek. Don’t wait until you’re passed the point of no return to find out the Rando has never followed an aid traverse! Did they bring their own helmet and rappel back-up? Sure, not everyone chooses to use both or either of these. They aren’t completely necessary, but it’s never a bad sign to know that the gal or guy you’re about to trust with your life is at least aware and concerned with their own well being. Did they bring their own ATC? I know, it sounds stupid. It is stupid. But I have had multiple partners tell me only after we’ve summited that they only brought a GriGri up with them. Which is a fine device. I love mine. But how do you expect to rap back down to the ground? What if something happens and you had to bail? A Münter Hitch you say? Do you really want to be pulling pigtails out of your rope for the next week?? Usually by this point you should be able to decide if you’re either stoked to climb together ooor maybe better off just taking a rest day. Assuming they have passed all or most of these tests it is always still a good idea to be double checking one another. As the vertical date commences you will very quickly learn whether or not you are a good match. Try your best to be a good partner. Remember, etiquette requires that you offer them at least a few hits of your summit beer/doobie and that if you’re tying the knots you’ll be rapping first. Assuming you both survived your first date, the question of a second will assuredly come up before you make it back to camp. Best case scenario; everything went well and you have a great partner for as long as you’ll both be around. Worst case scenario; well, this can be a difficult dance in itself. How do you tell someone you’re just not that into climbing with them if their tent is just a few yards away from yours? It’s like breaking up with a roommate. Talk about awkward. You could try lying and telling them you’re leaving, but then what? Do you sleep in a cave for a few weeks waiting for them to leave? Or do you slowly make your way up a big wall, spending as many nights on the wall as possible hoping they’ve gone by the time you get back down? Red Flag: Hand Jammies. Unless the climber is European, then they def. crush, or you are in Patagonia, cause they apparently are great there. Everyone else, beware. I have tested both of these strategies out and can say with confidence that they definitely work. If, that is, you’re better at living in a cave or on a wall than you are at dealing with difficult social situations. Better still though, instead of spending all that extra time and energy just to avoid someone try telling them you need to take a few rest days to restock on supplies and write some letters etc. Even if the Rando doesn’t get the hint they will still be inclined to find someone else to rope up with in the mean time and if you’re lucky they might not like you as much as they do their new partner. As a living breathing namesake, Dakota Walz represents the few unlikely big wall climbers to come from the 3rd flattest state in the union, North Dakota. On rest days or while driving across the country he scribbles away in his journal and writes the comedic vertical adventures of beloved mulleted rock stars, Shred All Fear. This is the type of stuff going on where Dakota writes at Shred All Fear!